What Is Health: Fitness Friday - How Important Is Aerobic Exercise To Lose Weight? Fitness Friday - How Important Is Aerobic Exercise To Lose Weight? 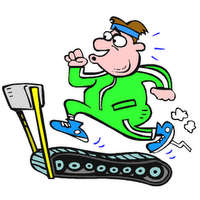 Every time I am at the gym it seems the people who are making the most progress are the ones on the treadmill. Their shirts are drenched in sweat and it looks like they are running a marathon. They are performing intense aerobic exercise. These people aren't putting themselves through that for no reason; they know the benefits of such an exercise. During Aerobic Exercise not only do you increase your heart rate dramatically, you move large muscle groups in your arms, legs, and hips. Your body takes in a LOT of oxygen. You bring in the maximum amount of oxygen into your blood stream. Your body pumps blood much faster. Your body requires more energy. The only way to get this energy is to move the oxygen through your blood stream. Your body release many endorphins. This in my view is the greatest part of Aerobic exercise. Once you are done your body and mind feels so great. Endorphins are your body’s natural painkillers. There have been many studies done to show that Aerobic exercise helps you live longer then someone that does not perform it. You will increase your body's stamina, help manage any stress, and improve your sexual performance. A study in 2003 by Harvard Medical School showed that men who ran 3 hours or more a week reported sexually functioning like men who were two to five years younger than them. If that's not a reason for men to get out there and run I don't know what is! Aerobic exercise is important along with a great diet.